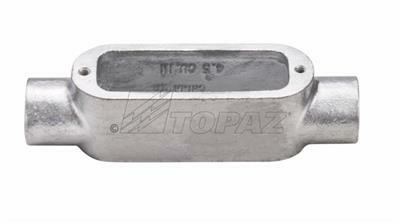 Topaz’s Malleable Iron Rigid Threaded type C Conduit Body is constructed to offer unmatched high tensile strength and ductility. Strong and resilient malleable iron fabrication is resistant to damage from corrosion and impact. C type conduit bodies are engineered with a straight through configuration and enable the easiest access for pulling and splicing. Roomy interior allows for maximum wiring space, smooth, rounded integral bushings in hubs offers protection for conductor insulation. Available in 1/2” to 4” sizes; UL listed.